Rate and Review to be in with a Treat! 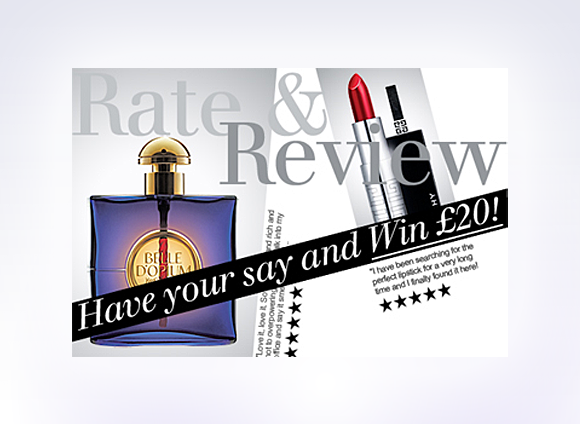 Did you know that when you write a review on the Escentual website you’re in with a chance of winning £20? Each month we pick five reviews that have gone that little bit further in providing detailed and useful information for others, and then we give them a little thank you. You don’t have to have recently purchased the product to make a review – if Cacharel LouLou was your favourite scent as a teen, then we want to know all about it. Likewise, if you’re a Serge Lutens-loving perfumista, then flex your creative muscles and describe your scent experience to us. Describe your memories and the olfactory journey that you take – you have a big audience of like-minded people! If you have a problem with a product, then tell us all about that too. For example, if you purchased the oily skin correcting La Roche-Posay Effaclar M and found that it really didn’t sit well with your very dry skin, then tell us and others who might have the same problem. We never get tired of reading reviews, so here’s big thank you to all of those who already take the time to let us know what they think. To everyone else – come and join in with our conversation! You never know, you could find yourself with a little bit of £20 shaped goodness in your pocket. This was bought to use as a moisturiser/make up base for my wedding to hopefully stop oil coming through my makeup. It worked brilliantly and seems to make foundation go on a little more smoothly. This entry was posted on Thursday, November 3rd, 2011 at 9:51 am and is filed under Spotlight On, Tried & Tested. You can follow any responses to this entry through the RSS 2.0 feed. You can skip to the end and leave a response. Pinging is currently not allowed.